2017 has been a tough year for small business owners in kenya mainly due to the political uncertainty that clouded the country for almost half the year. However, one thing stood out; the resilience shown by small business and sme owners in kenya through this tough times. 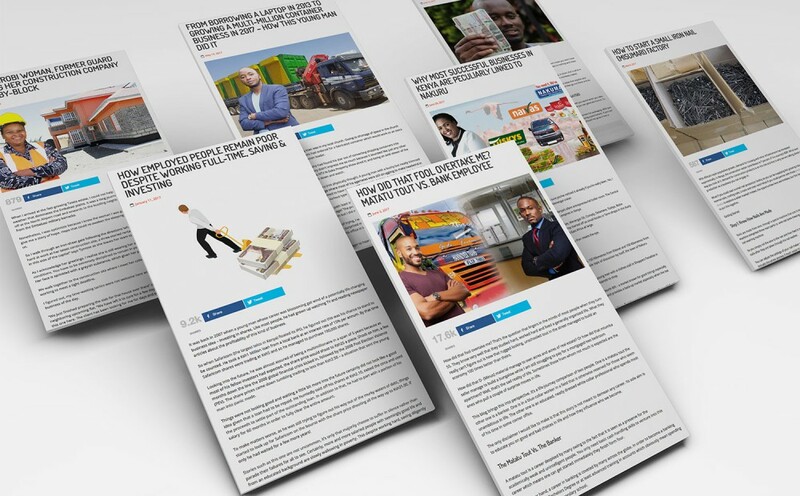 Through the year however, the kuza biashara blog has remained consistent in sharing informative articles that empower budding entrepreneurs and small business owners to start or grow their businesses. It’s that time of the year where we reviewed the articles that resonated most with our audience from inspiring life stories from entrepreneurs who had to overcome major struggles to build their business empires to creative business ideas you had no idea we’re viable and motivating articles to get you out of your comfort zone to go out and implement your business ideas. You’ve probably gone through the best schools, gotten excellent grades all through your education which helped you secure a job quite fast and now you have a healthy paycheck every month. However, could the fact that you are smart also be a hindrance to your progress in life? This article definitely gives you something to sit down, analyze and rethink the decisions you make in your life moving forward. The Kuza Biashara #SheGoesDigital Program was undoubtedly one of the most successful programs we conducted this year. The program attracted over 600 applicants from all over the country out of whom 50 young women were selected to go through the intense practical training free of charge. After 45 days, 42 young women successfully graduated from the training and were placed for paid internships at leading companies in the country. When you think about starting a mabati factory business, you think big expensive machines and a lot of capital. However, this article gives insight into how you can break through into the mabati industry with about Ksh. 5 Million and make a healthy profit of about Ksh. 4 Million per month. With a budget of as low as Ksh. 500,000 to as high as Ksh. 1, 000, 000, you could be well on your way to having your own Misumari Factory. This is a great business idea especially due to the booming construction industry in Kenya. This article clearly states all you need to know before venturing into the misumari business and make approximately Ksh. 210,000 profit per month. Moses Ndura’s story is certainly an inspiration to young people, especially those keen to venture into entrepreneurship. At barely the age of 30, the founder of Container World Kenya proves that you do not need a bank account full of cash to build your business empire. If you have been notorious for procrastinating implementing your business idea, Moses’ story will challenge you to get off your comfort zone. Most of us wake up early every morning to go to work so as to create a better future for ourselves and our families. However, does the comfort that employment provide also contribute to the costly misinformed decisions you are prone to make. This article is certainly an eye opener for us employed folks. This article takes the crown of our favorite article from 2017 because of how the writer paints a clear picture of how the choices we make in life have long term implications that you may ignore especially if you are short sighted with your goals. If you haven’t read this article yet, you have no idea what you are missing out on. Do you have any favorite articles from the Kuza Biashara Blog in 2017? Feel free to share with us in the comment box below.